Randy Hogan, Editor of The Daily World, has penned a column in the Random Thoughts section of the paper dated February 11-13, 2011. His column, Bones of Contention, concludes like this: "At this point, it may be in the best interest of the city to throw out all of the previous proposals that were placed on the table, roll up the shirt sleeves and start from scratch. Approve the items set in concrete by law and move on and compromise in the other areas." Hogan states that the job of mayor for Helena-West Helena is a "full-time" job. He also agrees with Alderman Larry Brown that Mayor Willis should accept the base pay of $48,000.00 in the "spirit of cooperation." (I state publicly, as I have over and over, the job should pay more than this amount). Hogan cites Willis's most recent veto. His columns makes an excellent attempt to be fair and balanced. However, Hogan errs in his discussion of the law. That is not surprising. He is an editor and not a "legal eagle" as he would say. Resolutions are binding in Arkansas law for many matters including budgets and appropriations. Resolutions, unlike ordinances, are not "permanent in nature." See AG Opinion 2001-230 Budgets are, by operation of law, only good for 12 months and may be extended for one month. A quirk in the same law is that you cannot legally have a 13 month budget. See AG Opinion 2002-268 Budgets are not permanent. There is no "emergency clause" for the mayor to invoke. It is made up. It's a figment of his infatuation. It does not exist under Arkansas law. Mayors have limited powers; only those granted by state law. Finally, the city council has the power to set the policy which he executes. See Snippet. See also Arkansas Municipal League AR Law FAQs. Therefore, the council can, as it has done on many occasions in the past, limit the mayor's ability to do many things that the mayor might otherwise desire to do. 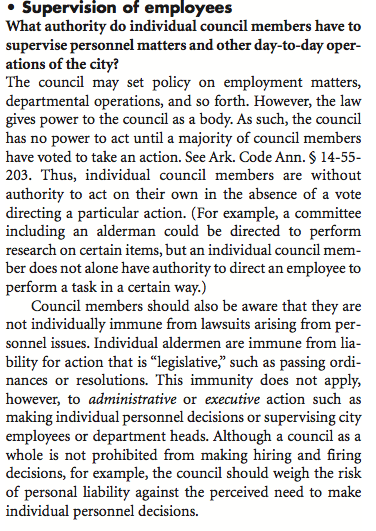 See Mayor's Duties Under Arkansas Law. It is, after all, a check and balance type democratic system. At any rate, Willis is headed to court. See Lawsuit. Judge Bentley E. Story will be called upon, once again, to settle disputes on the operation of city government in Helena-West Helena, Arkansas. In the meantime, it is our hope that Randy Hogan, Larry Brown and many of you are right, the "Art of Compromise" will prevail.